On February 22, 2010 the new law allowing citizens to carry firearms in national parks in accordance to state laws and procedures went into effect. Read the NRA-ILA Update here. Visitors may possess firearms within a national park unit provided they comply with federal, state, and local laws. Please remember that federal law prohibits firearms in certain park facilities and buildings. These places are marked with signs at public entrances. 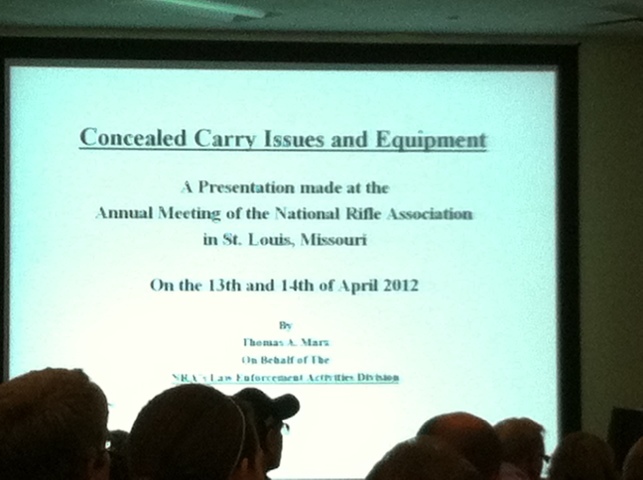 Back in May I blogged about attending the NRA Annual Meeting in Phoenix, AZ. I had a blast, however I had a number of gripes related to Arizona’s restriction on carry in any location that served alcohol (which included most of the the restaurants downtwon). A proposed law would have allowed Arizona residents and guests with recognized permits to carry in restaurants that served alcohol. The news is that it has passed the house. Congratulations to Arizonans. I do wonder what affect the attendance of thousands of NRA members had on Arizona. I know that I contacted numerous Arizona officials regarding my experiences on this matter. I imagine many others did as well. For those wondering what the NRA accomplishes, I believe this is but one example of the affect of the NRA. UPDATE: Passed the senate and is headed to the governor. Carry in Parks almost re-restored! Measure to Allow Conceal Carry in National Parks in accordance to state regulation has now passed both the Senate and the House. It was attached to a Credit Card Reform bill as an amendment. And while I dislike the whole system of attachments on unrelated bills, and would prefer to see a one-item per bill policy. Such is the politics in Washington. It’s attachment to the Credit Card Reform bill makes it unlikely that President Obama will veto the bill. For those following the National Parks carry issue. There was an executive order policy change by the Bush Administration, to allow carry in National Parks. While it seemed to some as a last minute decision by the former President’s administration, it had been in the work for quite a few years. This passage of this bill will eliminate that legal situation and re-restore our rights to carry in National Parks. Let’s just hope that Obama doesn’t veto the bill. If he does, it will truly show that his primary intent above all else (even restoring the economy) is gun control. PS – Sorry for being a little late getting the word out on this. I first heard about it going through the house a day or two ago. But am still recuperating from Phoenix. Trying to get caught up with everything…and not doing the best job. Have to face the wife tonight when she gets home, and wonders why I didn’t get half the stuff done I was supposed to. On top of that we’ve got a local battle in York on a proposed “Lost/Stolen” bill being re-introduced. And that consumed nearly an entire day’s free time this week. In the news… movie theatre shooting in PA! There are a number of movies coming out that I want to see, including: Tale of Desperaux and Clint Eastwood’s new film “Gran Torino”. A movie theatre was one of the first places of business I carried into, and with regards to carrying. Movie theaters are one of the most comfortable and least comfortable places to carry. Comfortable because they’re dark, and for a person new to carrying. It gives a comfort to the concerns of spotting, etc. Uncomfortable, because having a sidearm on can make trying to sit in those theatre seats a tad uncomfortable. For this reason there were times I contemplated not carrying my sidearm, but I remembered the adage “If you carry, always carry!” So I accepted discomfort in exchange for safety. Today’s news has confirmed to me that I made the proper choice. A family toward the front of a theatre was making noise. Being a dad, I suspect it was the usual family situation of parent trying to make child be quiet, then endeavoring to find out what it is that has the child making noise so that they can satisfy the child in hopes of quieting the kid. Well in this case, a fellow patron took offense to the noise of the family was making. He threw popcorn at the son then approached the family and drew a Kel-Tec .380 (I’m presuming this is the P3AT) pistol and shot the father in the arm. This confirms to me that my decision to carry in spite of being uncomfortable is indeed the right choice. Thankfully, this did not result in a mortal wound. However, I am very bothered by this situation, because this man was carrying a pistol commonly carried by permit holders. I am hoping that the shooter is not a permit holder, and just a typical scumbag criminal. Because such a situation is merely feed for the trolls at the Brady Camp. I was rather surprised not to have seen anything about this incident in the gun blogosphere. If anyone know’s more, please give us an update. Was James Joseph Cialella a permit holder or just your usual street urchin? UPDATE: Sebastian over at SnowflakesInHell was able to confirm the following charge having been made in this case.